Happy Friday! We are so close to the Christmas weekend, so I’m going to keep this post short and sweet. 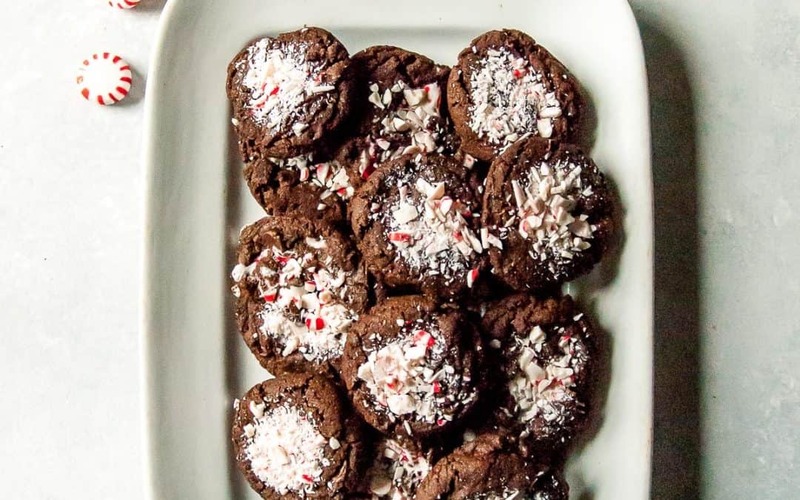 These vegan chocolate peppermint cookies are the crowning glory on my Christmas sweets for the season. I was really crossing my fingers when I made them, hoping they would turn out on the first try. Turns out, using my BFF Sarah’s vegan chocolate chip cookie recipe as a base for these was the perfect idea. They held up, didn’t require any weird egg substitutes, and didn’t require chilling time. 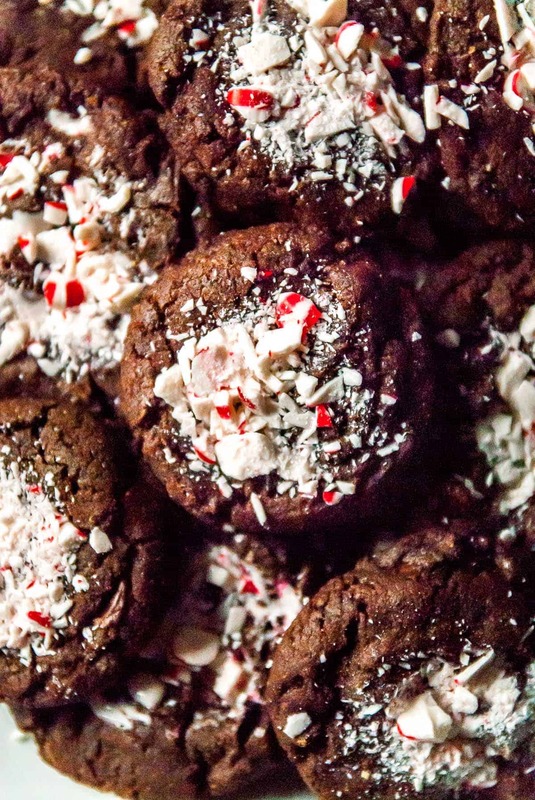 Take it from me and don’t press the peppermint candies into the cookies before baking, wait until after! If you press them in before they will melt all over and make kind of a red and white mess that you just don’t want to deal with. Side note: I used peppermint candies for the middle filling, but crushed candy canes would be just fine too. I would also recommend not baking the cookies for more than 10 minutes. I baked one batch just a little over and they ended up being a bit dry. But if you do overbake them, stick a piece of bread into the container with your cookies and that will soften them up in no time! 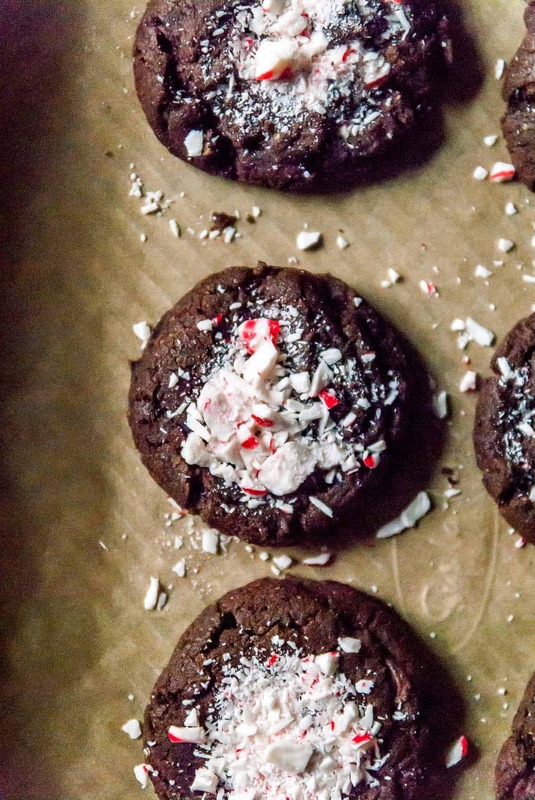 Really though, the magic time for baking these vegan chocolate peppermint cookies is right at 10 minutes. They are going to seem underbaked, but they are going to be perfectly crispy and chewy once they cool down a bit. 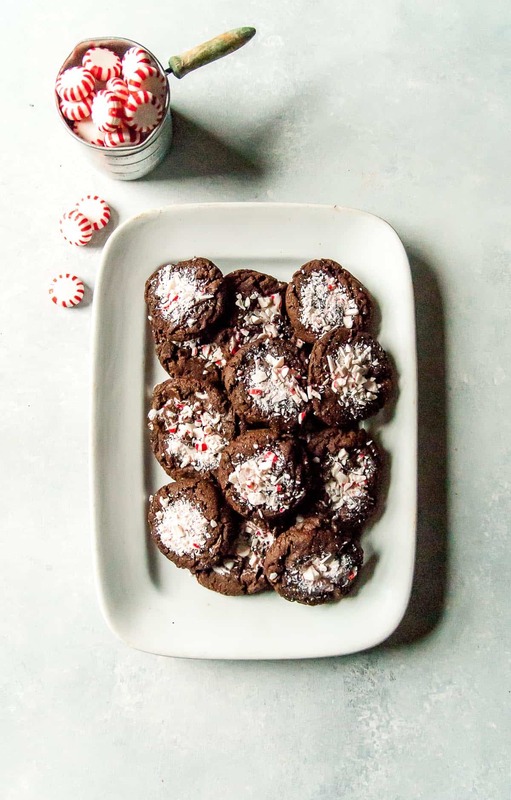 Besides that, the instructions for these chocolate peppermint cookies are super simple. I hope you all enjoy baking these as much as I did—I know for a fact that you’ll love eating them! These cookies were part of Rodelle’s 21 Days of Cookies campaign! 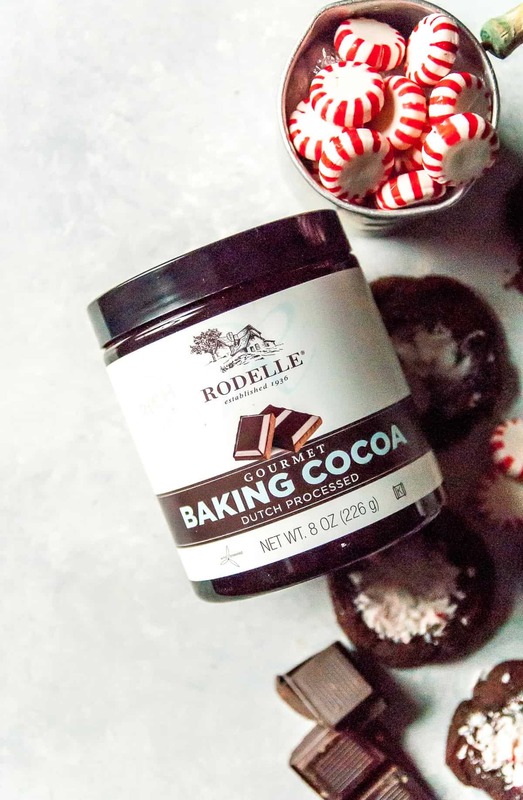 While I know you know my love for Rodelle, their cocoa powder was perfection in a batch of these vegan chocolate peppermint cookies. Preheat oven to 350ºF. Line two cookies sheets with parchment paper and set aside. In a large bowl, whisk together the flour, cocoa powder, flaxseed meal, salt, and baking soda. Set aside. In a medium bowl, stir together the granulated sugar, brown sugar, olive oil, water, vanilla, and peppermint extract. Add the sugar mixture to the flour mixture and mix until combined, until no flour streaks remain. Fold in the chocolate chips. Scoop the cookie batter out onto the prepared cookie sheets by the tablespoon. Bake for 10 minutes. 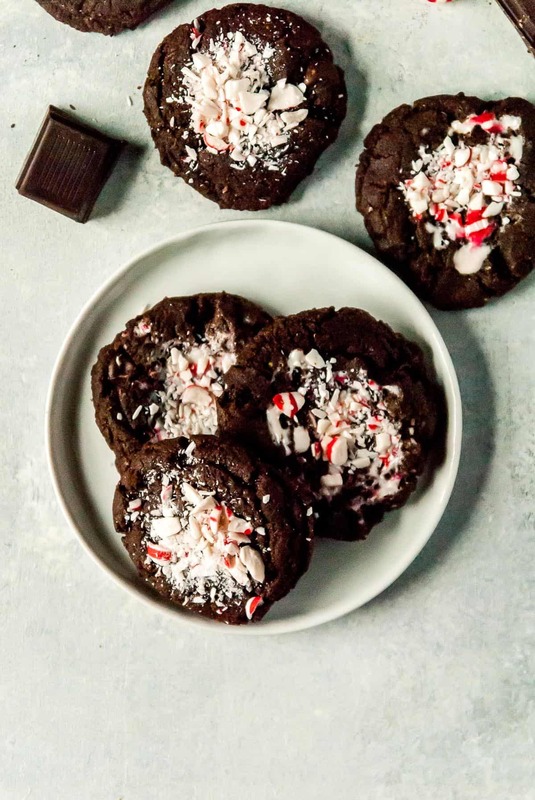 Immediately after removing from the oven, press a teaspoon full of crushed peppermint candies into the middle of each cookie and allow to cool. Store in a covered container for up to 5 days. I’m not a huge sweets person, but I LOVE the combination of chocolate and peppermint! These cookies look fantastic, Abby 🙂 Merry Christmas from my family to yours! These sound wonderful, thank you sharing! Merry Christmas!